Cyprus University of Technology and “Ev Zin” Runners Club, supported by Limassol Municipality, are organizing the 2nd corporate only, charity relay race (4 x 4km) “Run 4 All”. The race will take place on Sunday, April 29th, 2018. The start and finish of the race will be in the historic city center of Limassol, at the University Square and the biggest part of the run route will be along the seafront road. A 500m fun race for kids will take place. The kids run race will start and finish in front of Limassol’s Town Hall. Kids Fun Race will start at 11:00 a.m.
GET Lab supports Run4All! 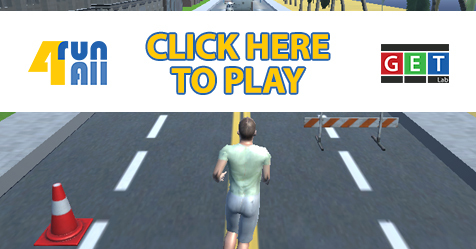 This is why we designed and developed the Run4All Game, which is a web based endless runner game. Click the above image to play the game on your browser!